2 attractions. Millenium Falcon and a new ride that " puts you in the middle of a battle between the First Order and the resistance". More detail at the Parks/Resorts event. Believe they also said the setting was a new planet. Flying the Falcon! I am almost OK that most of DHS is closed down now. That’s the end of the presentation everyone. Meh the force be with you, I guess. There will be two – At Disney Hollywood Studios in Florida, and the other in Anaheim. Loud cheers greets this announcement. 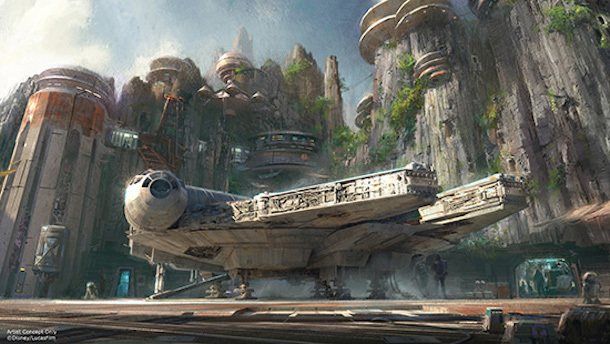 Two signature attraction, including “the ability to take control of” the MIllenium Falcon. You’ll have a chance to run into all the droids and romaning beasts that Star Wars is known for. Every store and restuarant “will be operated by local inhabitants”. Nothing will be out of character or stray from mythology. There will be a cantina as well. Largest ever single themed land expansion ever, he’s saying. Certainly the largest single themed reason to sit for more than two hours to get to this news. 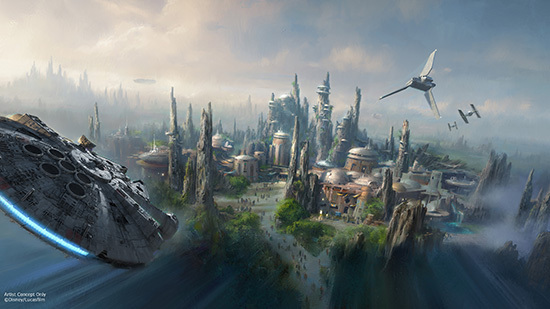 Iger is announcing that the rumors of a Star Wars land at Disneyland are true. BOOOM! Amazing. The DHS (Millenium) Falcon rises from the ashes in glory. Well 6 can't come fast enough now. So much for no specifics. Even more will be provided at parks and resorts panel. This is great news. I'm so excited to have something of this size and scope to look forward to. The brand new planet is a genius idea. This is all unreal.